Freshly baked or toasted, I love these buns and bake a batch whenever it takes my fancy, leaving off the crosses if it isn't Easter. I also like to vary the dried fruit a mix of chopped dates, cranberries, apricots and cherries is particularly good. If you have a food mixer, combine the flours, water, milk, yeast, salt and sugar in the bowl and fit the dough hook. Add the egg and butter and mix to a sticky dough. Cover the dough and leave to rise in a warm place for about 1 hour until doubled in size. Knock back the risen dough and divide into 8 equal pieces. Shape into rounds and dust with flour. Place on a floured board, cover with plastic or linen and leave to prove for about half an hour until roughly doubled in size. To make the crosses, whisk together the flour and water until smooth, then transfer to a greaseproof paper piping bag and snip off the end to make a fine hole (or use a plastic food bag with a corner snipped off, as I do). 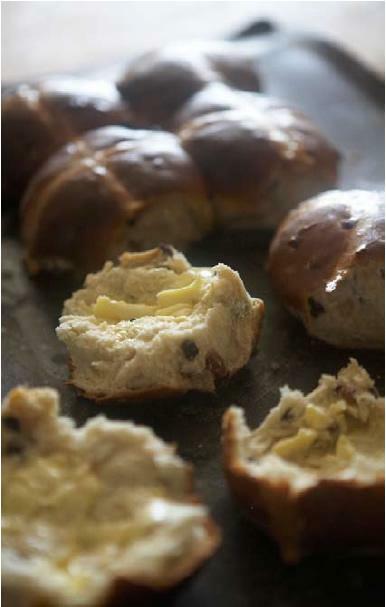 Transfer the risen buns to a baking tray and pipe a cross on top of each one, then bake in the oven for 15-20 minutes. Meanwhile, melt the jam with the water in a pan. Brush over the buns to glaze as you take them from the oven. Transfer to a wire rack to cool. Serve warm, cold or toasted.